It was a beautiful day. 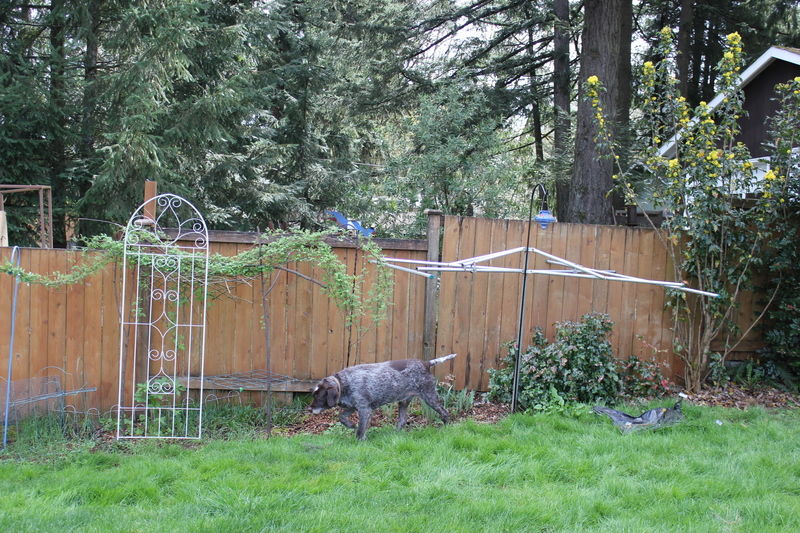 I’m on the healing side of some major dental work, so staying home and playing in the garden – oh, yeah. The weather was nice enough that I could afford several leisurely hours of work – nothing intense – without having to wear rubber boots and a raincoat. My Lenten Rose is just beautiful this year! *Also known as an hellebore. I’d love to have more in the back corner (I planted three: one survived). 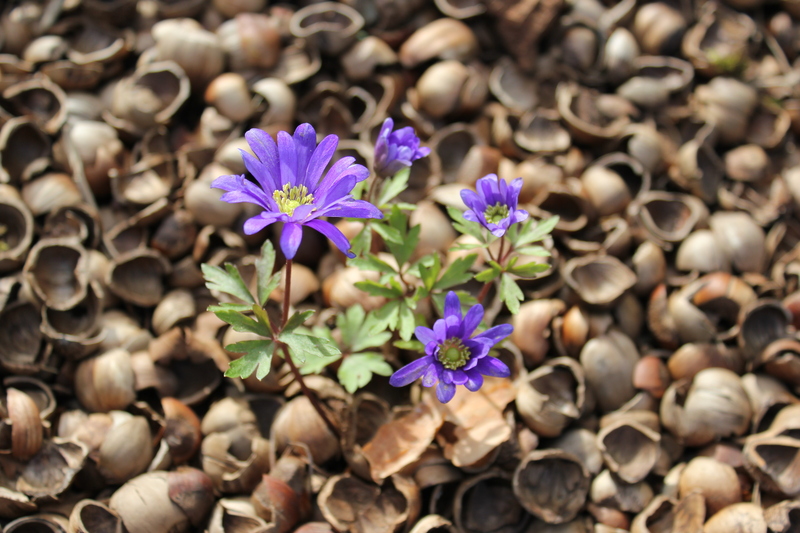 This Grecian windflower (interestingly, it is in the same class of plants as the hellebore: ranunculaceae) is one of my early Spring favorites. 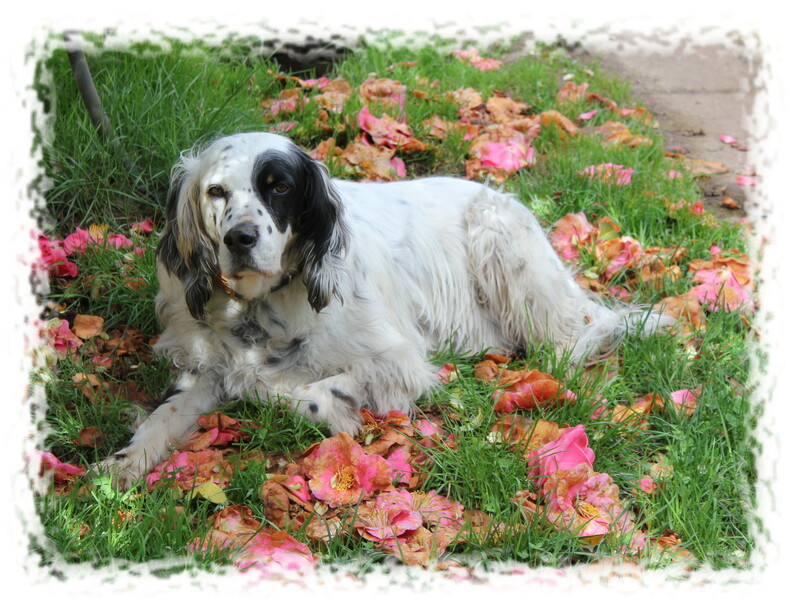 I planted a bunch of them the first fall we had Murphy and he dug up (and ate) most of them. This one struggles up early every Spring. This is one of our “problem” plants. 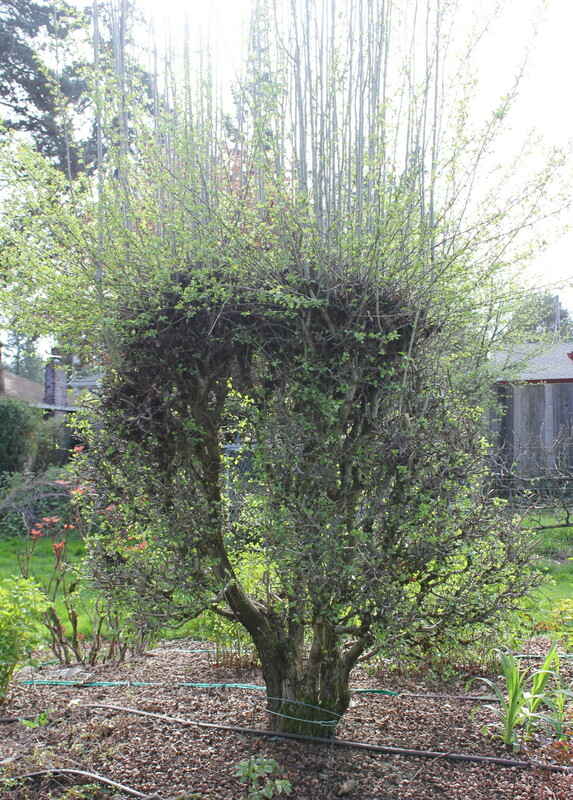 It is a native Black Hawthorne. Don dug it out of a pasture where it had been run over by a Caterpillar several years in a row. He still struggles to keep it dwarfed, but it has a mighty strong will to grow into a tree. He had to cut all of the upright shoots and shake out the dead leaves caught in the middle. Looks easy, but there is something you need to know about Black Hawthornes, and that is this: they have needle-sharp thorns. These aren’t thorns like a rose bush or even a Himalayan blackberry has. The thorns on the Hawthorne are about an inch in length, thin, and stiff as needles. They are NASTY. For that reason, the little birds love the Hawthorne. This is another problem area: the south fence. I’m working on it. I planted a native Black-cap raspberry which took off last summer (speaking of thorns!!). The old canes are festooned in greenery right now and will soon bear blossoms. I hope to have a good harvest of my favorite raspberry. The new canes have not come out yet, but when they do, I will train them to grow the other direction, over the old clothesline frame. In the fall, after the harvest, I’ll cut the old canes off (I wear welding gloves for this work – they’re stickier than those afore-mentioned Himalayan blackberries and while they’re not as deadly as the Hawthorne, they grab everything and poke). I’d like to kill those mutant Oregon grapes. I wanted little native ones and ended up with invasive trees. At least I know the werewolves won’t trespass! The dogs are pretty good about staying to the grassy area now. Now that I have the raspberry established, I need to work on what grows underneath it: I have sun-loving plants in there and it simply does not get enough sun. I’m thinking native plants, but not quite sure WHAT. 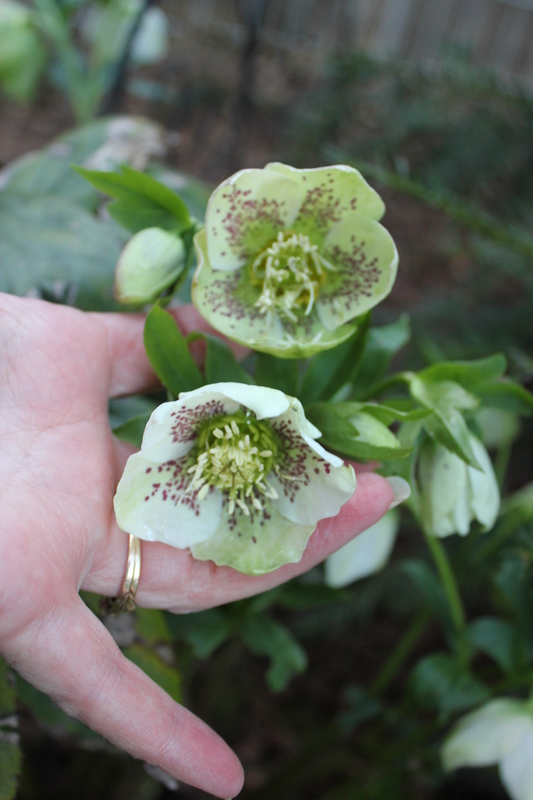 More hellebores? I want color. Flowers. This continues to be a work in progress: my corner garden. 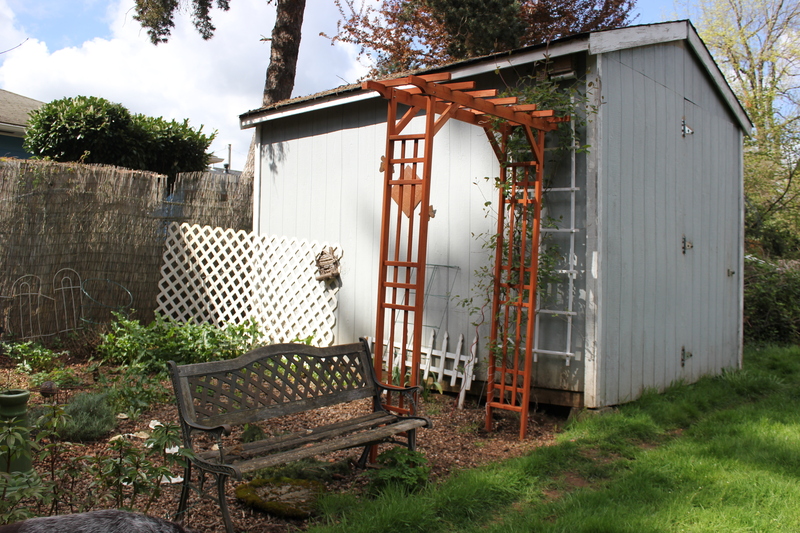 I got an arbor for the honeysuckle. My husband says I put it up crooked, but he didn’t exactly offer to help me put it up (he did, however, assemble it for me). 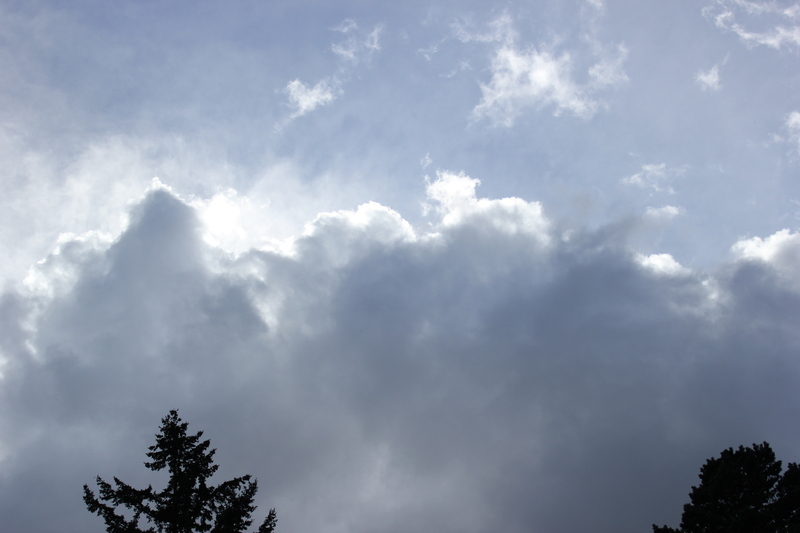 The sky today. It was so beautiful out. Did I mention that? 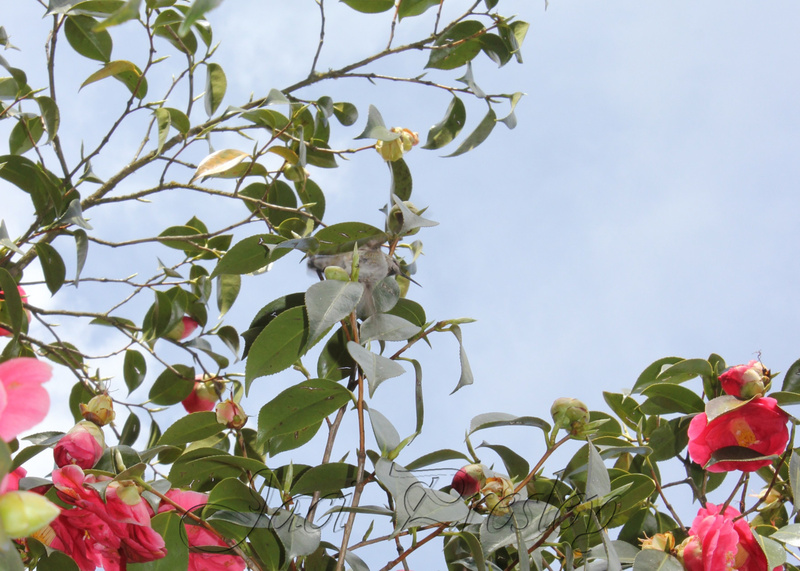 The female hummingbird (Anna’s, I think), was perched in the Camellia. She air-lifted just as I snapped the pick (she’s smack dab in the center – click on the photo for a larger view). 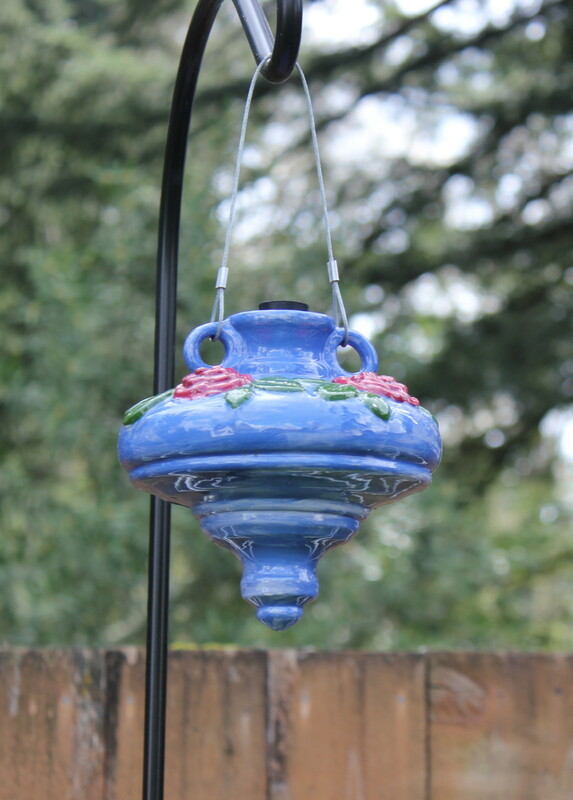 I can’t keep my hummingbird feeders full right now. I just refilled yesterday. 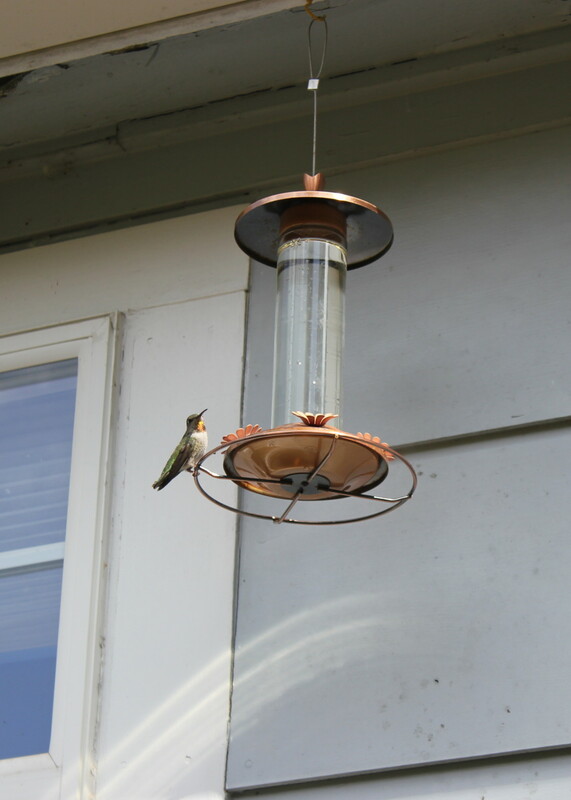 This is my newest hummer feeder (and a Goodwill find). The birds love it. 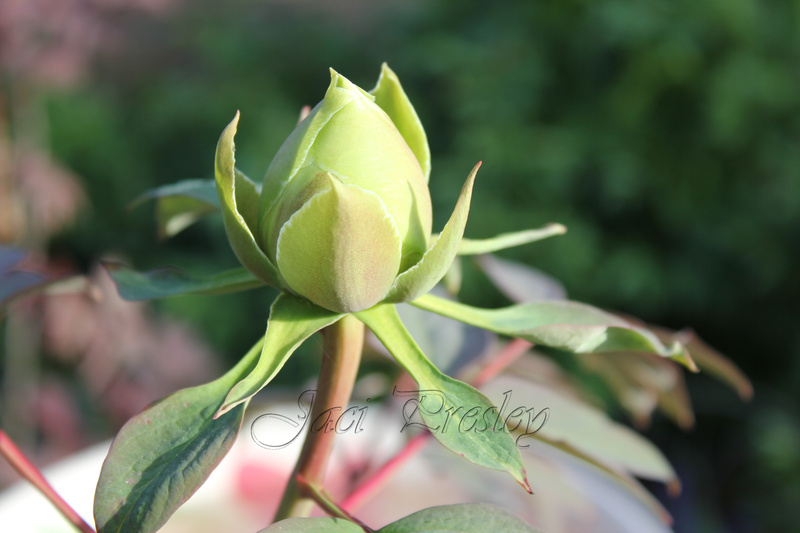 This is killing me: the anticipation of the first peony bloom! I *think* it will be this tree peony, but the buds are swelling everywhere in the yard. I’m so excited! 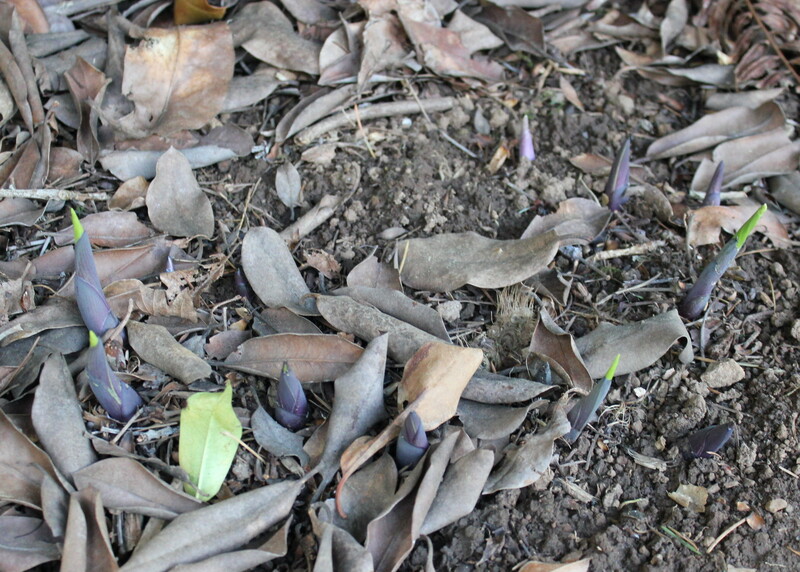 Hostas poking up through the rhododendron detritus. 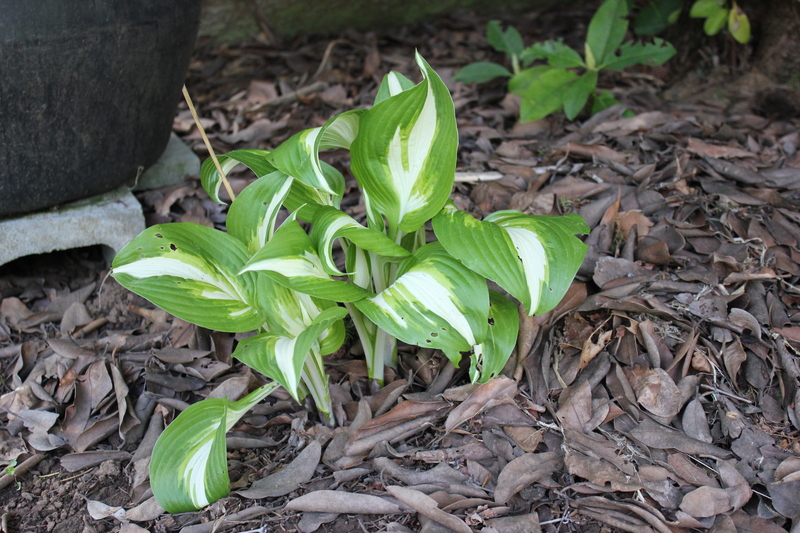 The variegated hostas are already up. There are so many more green things growing and blossoms swelling. Tulips are opening and the lilacs are starting to hint. The apple tree is just beginning to put forth buds. I counted three buds on my Oriental poppy. I planted pansies. I planted nasturtiums. The first rhodie is abloom.